A LOCALLY-PRODUCED, FULLY ORCHESTRATED ROCK MUSICAL! A CAST OF 25. A SEVEN-PIECE ROCK BAND. THE CAPE PHILHARMONIC ORCHESTRA. Rockville 2069 tells the story of an earth destroyed by man’s neglect and climate change. 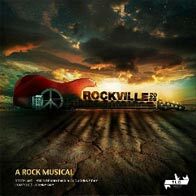 Only Rockville, a small archipelago of islands survives, and is now home to a group of peace-loving rockers, sound technicians and musicians. This thrilling new show, coming to Artscape in August, combines artists and musicians from different cultural and musical backgrounds to bring an electrifying new voice to the rock musical scene. With 3D animation and a 100sqm LED screen, technology plays a key role in creating this believable, constantly shifting production set in the year 2069. The story opens at the celebration of Woodstock Festival’s 100-year anniversary. The world comes to an end during the opening act and, as survivors in the only breathable land left on earth, they create a protective force field that shelters them from the frozen wasteland and toxic fog that is Earth. To generate this vital shield with resonating sound waves, Rockville’s musicians play each day at dusk and dawn. A tale of betrayal, treachery and greed unfolds, only to be resolved in an epic battle of the bands, fueled by loyalty and love. ONE HUNDRED YEARS AFTER WOODSTOCK, CAN MUSIC STILL STOP A WAR?